The area of Shanghai known as Tianzifang, off of Taikang Lu, is several of my friends' favorite place in Shanghai. It was described to me as a neighborhood containing unique art galleries, shops, and little cafes where you can sit for an entire afternoon doing work. Sounds like my kind of place, no? Therefore, I decided that it would be the first place in Shanghai I'd check out on my first day off of work since arriving here. Tianzifang turned out to be a tourist-happy collection of small little lanes tucked in between two larger and more modern streets. There are art galleries and souvenir shops and lots and lots of bars, cafes, and restaurants. After wandering for a bit amongst the waiguoren with their fanny packs, white sneakers, and DSLRs slung around their necks (tourists do look the same anywhere in the world), I had lunch at a cafe that cost slightly more than I had wanted it to, which solidified my suspicions of Tianzifang as a tourist site catering to foreigners. Not a big deal. There's bound to be places like that in all the cities in the world. But it did mean that I didn't stay as long as I had thought I would, nor did I buy anything, nor did I have any fun adventures. It's a pretty and quaint little place, but I think I will content myself with imagining it set in a small town full of friendly locals and friends. More to come as I go off in search of Steph-happy places in my new city! 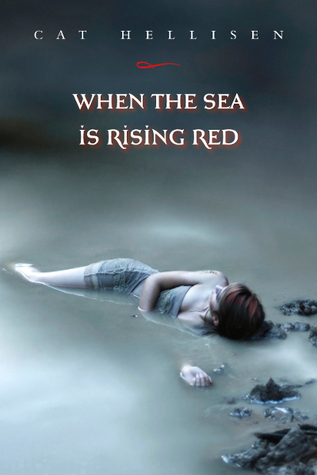 It's simple and on the chick-litty side, but I think that its simplicity makes it stand out from most other YA covers. It gives me a little sense of vertigo: the model's going down while the words are right side up. Wahhhhh whoaaaaaa! Ohhh, that image. *swoons* The bokeh (sp?) effect in the background, the starkly backlit models... both contrast greatly with the graffiti-style title, a mixture of the stylish with the, well, stylish (in different ways). 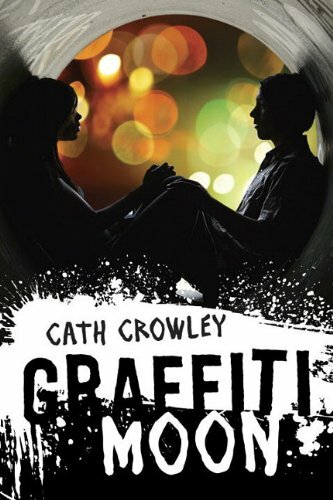 Plus it's by Cath Crowley, who's an incredible contemporary author, and I have the Aussie version of this book somewhere... so obviously I'm going to recommend the heck out of this book. I appreciate an epic fantasy-esque cover with an intricate design focus and a complementarily intricate border. Not only do I think that this cover will probably catch the eyes of Rick Riordan lovers, but I also appreciate the balance in the cover's layerings, from the interesting symbol and title font in the foreground, to the silhouettes in the back. Reminiscent of Lauren Henderson's Scarlet Wakefield series and Carrie Ryan's zombie books, this cover is deceptively simplistic. The muted colors and textures actually make what colors and textures there are in the image stand out all the more, like the flash of red in her hair, or the rocks in all that milky liquid (is it water? It certainly doesn't look like it!). Droooool. Look at that cover!! Isn't it so fun?? I love the colors, the whimsicalness, the detail of the background. It just brings me back to the good old Disney days. 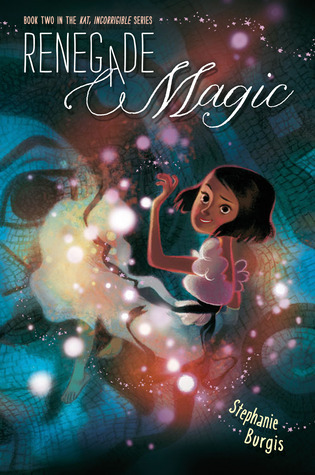 Looking at this cover, and knowing how incredible a writer Steph is (I loved the first book in the series, Kat, Incorrigible), I know I can expect pure magical adventurous goodness. Chloe knows that her magnetic older sister Ruby would do anything to make sure Chloe is happy. So when Chloe returns to their small Hudson Valley town two years after the tragedy that initially drove her away, everything seems to be as it once was. But it is the very sameness of their lives that makes Chloe suspicious. Ruby also seems to be acting strangely, making unreasonable demands, disregarding everyone’s feelings except the two of theirs. What secrets are Ruby hiding, and how far will she let things go before everything falls apart? Beautiful prose, a mesmerizing setting, and a mysterious premise are, in the end, not quite enough to make up for the minimal character development and slow-moving plot in this ambitious and convoluted novel. IMAGINARY GIRLS is beautifully written, but the lack of attachment I felt for any of the characters meant that I actually had to struggle to finish this book. The jacket copy for IMAGINARY GIRLS doesn’t tell you much, and it’s better if you go into the book knowing just the little you know. 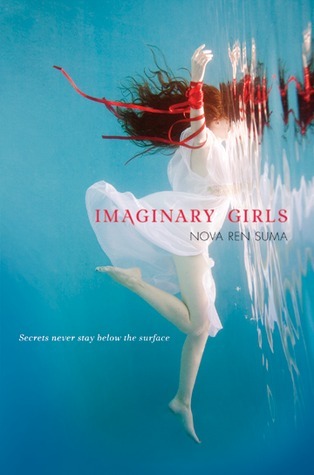 Nova Ren Suma writes in a languid style similar to Sarah Dessen when she is feeling particularly poignant, meaning that the small-town reservoir-side setting and the weirdness of the situation is well-evoked. IMAGINARY GIRLS is a very atmospheric novel—and even though it’s hard express the significance of the setting, it’s also probably impossible to imagine this story set elsewhere. The fact that IMAGINARY GIRLS seems to focus more on beautiful prose than character development means that the characters—not the least of which is Chloe, the protagonist/narrator—come off as only vaguely intriguing, their interestingness born more out of the roles they are assigned in the story than they themselves. Chloe in particular is like a spluttering match next to Ruby’s Mag-lite glow—and yet Ruby’s magnetic persona, unfortunately, anchors its credibility in the telling of her magnetism rather than the showing of it. Chloe waxes eloquent for so long on Ruby this, Ruby that, that, “in the flesh,” Ruby is actually not as intriguing as Chloe makes her sound. Chloe suffers from “everyone is more interesting than me”-itis. In short, Chloe has no personality. She has no defining characteristics besides being the narrator and Ruby’s younger sister, which I suppose is partially the point, but then she doesn’t grow a whit throughout the course of the novel. Why is it all too easy for protagonists in contemporarily set novels to be passive and bland? I really wish authors would catch themselves when they are writing bubbles as main characters: see-through substanceless creatures that threaten to disappear into nothing at the slightest touch. IMAGINARY GIRLS didn’t work for me primarily because of these reasons, but I know that the majority of other readers have really loved this book, so don’t take my word for it. I wonder, though, if there are or will be other readers out there who had the same problems with this book as I did. Cover discussion: In-te-res-tinggg. It's quite a stunning image... but as far as I'm concerned, it wasn't the most representative of the story for me. Requested for review from publisher/NetGalley. In a city of 20 million, there's bound to be a teeny tiny bit of traffic congestion on the streets. The roads are a conglomeration of different transportation vehicles: cars, of course; public buses with antenna-like side mirrors that reach down from the roof and thus remind me of antennae; waves of people on scooters (which are mini-motorcycles, or Vespas, I guess) with a silver container strapped on the back that I thought was either the gas tank or a super-sized lunchbox, but is actually just a general carry-all; countless people on rickety cheap bikes (if you have a nice bike, it WILL get stolen); and pedestrians and taxis weaving through them all. It makes a lot of sense to take public transportation or ride something smaller and more nimble in Asian cities, where a whole bunch of people live in the same space and are moving in all different directions. The super-busy intersection outside my apartment! But what amuses--and partially terrifies--me is how traffic laws in Shanghai are taken as kind of suggestions instead of, well, laws. It's common to have cars zooming through intersections 5, 7, or even 10 seconds after the light has turned red. Shocking if you're on foot and three steps out onto the road before you see that five cars are bearing down on you. Scooterists in particular are fond of driving the wrong direction in the unofficial two-wheeled vehicle lane. All these various vehicles and people do an astonishing sort of dance around one another on the streets and even sidewalks. A bus will barrel down a street, taking the place on the road where taxis, bikers, and pedestrians seem to have been just milliseconds before. And then, a few seconds later, the bus will make a seemingly impossible dodge around three taxis and 5 two-wheeled vehicles approaching and weaving through the intersection from all different directions. I'd be impressed at the deft way in which the bus drivers handle their large vehicles and the almost total nonexistence of accidents if I weren't on the bus and being thrown back and forth by its jerky motion. The intersection near my office (also busy, of course). The Shanghainese also LOVE to honk. They honk at people before them at intersections who don't get moving approximately a quarter of a second after the light turns green. They honk at drivers in the lane next to them who they think are going to try and merge. They honk at pedestrians crossing the road 20 meters before them. They honk at you if they're trying to turn left and you're crossing the street and technically have the right of way. They honk when other people are honking, which leads to a whole gaggle of honks that go on and on for about 20 seconds. The other thing about honking is that it can occur at any time of night or day. There is a bit of a lull between 2-5am (thank God), but all bets are off as soon as the sun rises at 5am, which in Shanghai means that the sky gets lighter but you don't typically actually see the sun, due to the perpetual smog. Whenever I'm awakened at 5:30 in the morning by the sound of people blaring their horns outside, I think about how in New York you get fined for honking, and whether or not it'd be possible to institute something similar here. From what I can see, there is no such thing as "right of way" or "yield" in Shanghai. If you try to yield at every opportunity in which the Western world would consider it appropriate to yield, it'll take you three times as long to get to your destination. So no one yields, and the journey is a little more chaotic and life-threatening than it has to be, and everyone gets to their destinations in the relatively same amount of time. The JC Mandarin, a high-end hotel, on Nanjing West Road, the street near my office. Shanghai Centre on Nanjing West Road. Super high-end and classy hotel/shops. Some Hong Kong actor apparently arrived there when I was getting my lunch there the other day. 1. I like to take pictures of nature. 2. I find it much harder to take pictures of manmade things. 3. I find it much harder to take pictures of manmade things, particularly when other people are around. 8. because I am weird and solitary and would ideally live in a cave by myself if our personalities were personified in our living situations. 9. Shanghai is a city of, like, 20 million people. 10. Ergo, it is an urban jungle and a nature wasteland. 11. The most greenery I typically see in a day is the plastic little bobbly plant-figure in the office. Y'know, the one that has leaves that gently bob up and down, up and down, up and down all day long. 12. I don't actually, uh, do much. 13. Work takes up a significant portion of my time, and at the end of the day there's nothing I'd rather do than to sit and bed and zone out with a book or movie. 14. Plus, the sun sets at, like, 7 here in Shanghai due to various reasons both environmental and political that I am too out of my mind to get into at the moment. 15. This is particularly bad for my energy because, well, my energy goes up and down with the sun, and therefore on overcast days I am pretty much all but comatose and useless. 16. I had someone to do things with. 17. And by "someone," I don't mean just a friend or a family member or whatnot. I'm talking about soul-mate, best-friend, significant-other kinds of "someone." 19. the type of travel blogging you can expect here will be extensive commentary on the cultural differences between China and the US, in a variety of manners, on a variety of topics. 20. The pictures will be bland and generic and totally unworthy of National Geographic, because I am too much of a pansy to get up close and personal to take pictures of interesting strangers alongside interesting sites, and there are no natural things for me to take endless pictures of here. 21. But! I do have plans to explore a different part of Shanghai on each one of my free days, so there WILL be stuff to write about, in addition to the commentary on cultural differences. 22. And, if you'd like to help me increase my travel-blogging productivity, you can find me a boyfriend. And then we can have many fun adventures and pictures with actual people in them. I'm featured in a Shelf Awareness ad! I thought I was seeing things, so I did like a quadruple take. But no, that's my name--really, my full name--right up on the top of the July 18 issue of Shelf Awareness. Simon & Schuster decided to use a quote from my review to promote Tabitha Suzuma's Forbidden (which, incidentally, really is an astounding book, and you can read my full review here). Talk about being floored at the honor. Wow! I was floating in a cloud all day. Growing up in small-town Mississippi with an abusive mother and classmates who make fun of her, midnight-skinned and wild-haired Davidia Jones makes her escape into Molly Ringwald films. Davidia dreams of her own Molly Ringwald Ending one day, in the form of the most popular boy in school and her crush, James Farrell of the Farrells of Farrell Fine Hair, sweeping her off her feet in front of the whole school. But after a particularly bad school joke, Davidia decides to head west, to LA, where she renames herself Davie and transforms into a sultry lounge singer. However, Davie’s past catches up with her in LA when, 16 years after high school, she crosses paths with James Farrell again. A lot has happened in the meantime. Will Davie’s history prevent her from ever getting her happy ending? I have been hearing unequivocal love for this book for, oh, about two years or so before I finally had the opportunity to participate in a blog tour for 32 CANDLES. First stop: dive into the book that a small but important contingent of the blogging population has been raving about ever since its publication. And I wasn’t disappointed. I so wasn’t disappointed, in fact, that 32 CANDLES is easily one of my favorite books of 2011 so far, and one of the most adorable books I have ever read. The star of the show is Davie Jones. Neurotic without going overboard, self-reflective without it getting in the way of pure entertainment, and unapologetically weird, Davie stands out from the slew of debilitatingly neurotic female protagonists that usually feature in romantic comedies. Davie is like a black Bridget Jones without the weight obsession, which, let’s admit it, got frustrating real quickly. Davie’s weight obsession equivalent is her endless fascination with James, which in her high school stage was admittedly a bit scary. But somehow Ernessa Carter, through the voice of Davie Jones, makes everything okay. We don’t judge Davie for her neuroses; we love her all the more for them. No romantic comedy is complete without a swoon-worthy romantic interest, and James has got the role down pat. He is a perfect black man, and yet somehow his perfection seems like a perfectly natural part of his character, instead of a fictional construct forced upon readers that screams “I am perfect! I am perfect!” without ever actually showing us why. So, another point in 32 CANDLES’ favor. Yay! I’m sure there are many other reasons I can go on and on about—how the secondary characters take on lives of their own; or how the plot, while twisty and turny, wraps itself up in the most delightful and unexpected of ways—but I hope it suffices to say that 32 CANDLES will retain a permanent position on my shelf, as something I will reread whenever I want a dose of a good ole romantic comedy that won’t ever fail me. Brava, Ernessa Carter, and I want more! Cover discussion: I like it! I like that there's clearly a black woman on the cover, and the woman's wild hair is definitely reminiscent of Davie's. At the same time, there's this sort of retro-esque funkiness in the colors that hints at the 80s, Molly Ringwald motif, as well as Davie's zaniness. Nicely done! Copy sent for review by publisher as part of TLC Book Tours. 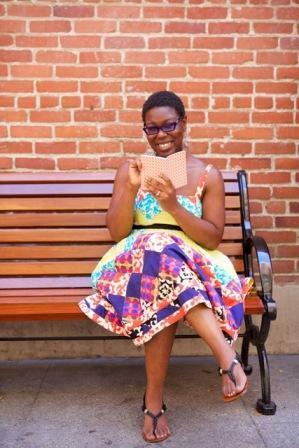 Ernessa T. Carter has worked as an ESL teacher in Japan, a music journalist in Pittsburgh, a payroll administrator in Burbank, and a radio writer for American Top 40 with Ryan Seacrest in Hollywood. Carter’s also a retired L.A. Derby Doll (roller derby). A graduate of Smith College and Carnegie Mellon University’s MFA program, she now lives in Los Angeles. 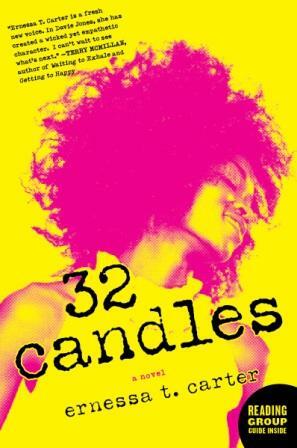 32 Candles is her first novel. She blogs at www.fierceandnerdy.com. This review is part of TLC Book Tours' blog tour for 32 Candles. The next stop is tomorrow at Freda's Voice. Click here for the entire tour schedule! 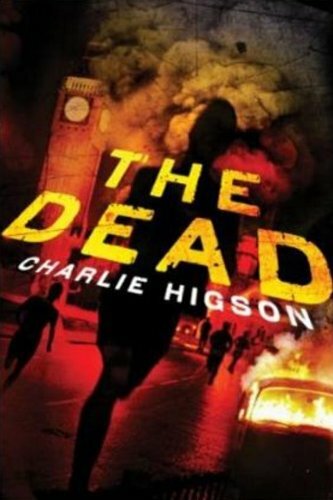 Author Guest Post: Charlie Higson! Today, author Charlie Higson, author of the zombie horror YA novel The Enemy and its sequel, The Dead, is here to discuss the intriguing dilemma of fictional characters' understanding (or lack thereof) of their classical literary roots. 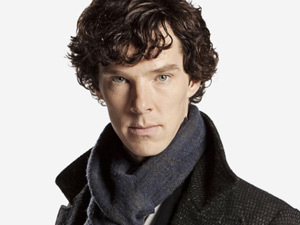 One of the biggest new drama hits of last year on UK TV was a modern reworking of Sherlock Holmes, starring Benedict Cumerbatch as Holmes and the soon-to-be-Bilbo-Baggins, Martin Freeman as Dr Watson. It was a lot of fun, very stylish, and managed to reinvent a lot of the stuff from the original books in a satisfyingly modern way – right down to Watson being a retired army medic freshly returned from Afghanistan. This was Sherlock Holmes with mobile phones, the internet and nicotine patches instead of a pipe (a really sticky case would be a ‘3 patch’ problem). I always have a slight problem with projects like this, however. There’s an irritating little voice nagging away at the back of my mind. It goes something like this… How come nobody in the show says to Sherlock ‘Hey, you’re called Sherlock Holmes, just like the guy in the books, and you’ve got a friend called Doctor Watson! What are the chances of that?’ Sherlock Holmes, in any modern adaptation, has to live in a parallel universe where Conan Doyle never wrote the original books. It’s one of the suspensions of disbelief we are always faced with when engaging with fiction. It’s the same with soaps – why do none of the characters do what everybody else in the country does – i.e. watch soaps? I just finished Jeffery Deever’s new James Bond novel – about a contemporary Bond starting his career in MI6. And I did sometimes wonder how come James Bond is the only person in the world who’s never heard of James Bond, or seen any of the old movies. Funnily enough, in the obituary of James Bond printed in Ian Fleming’s You Only Live Twice (supposedly written by M after he believes Bond to have been killed on a mission) Fleming attempts to integrate the ‘real’ world with the fictional world of the books. He claims rather clumsily that the books were fictionalized adventures from the life of the real James Bond, written by a friend. It’s fun, but doesn’t really work, and shows up the impossibility of fact and fiction existing side by side. You are faced with the same problems if you put classical allusions in a story, or have echoes of classics from the past. No one, for instance, says in West Side Story (or indeed in any of the other countless retellings of Romeo and Juliet) “Hang on a minute, this is exactly like Romeo and Juliet. We’d better stop all this nonsense before someone gets hurt.” And I must confess I have never read James Joyce’s Ulysses, but perhaps one of you literary types reading this can confirm, it never strikes Leopold Bloom that in some weird way he is acting out the story of the Odyssey on the streets of Dublin. I’ve always loved the Greek myths. I devoured them as a kid, studied them at school, and still go back to them for inspiration. They contain the templates for just about every modern story you can tell (I’m talking exclusively about western culture here, of course). Anything that involves a bunch of characters setting out on a quest has to be influenced by Jason and the Argonauts or the Odyssey. Any war story about a large bunch of heroes has to be influenced by the Iliad. Homer covered just about every variety of hero you can imagine, and set the mould. Be it pure, honest but doomed Hector, devious womanizing Paris, strong but stupid Ajax, vain but (nearly) invincible Achilles, wily Odysseus, Menelaus, fighting to get his kidnapped woman back…They are all there. I’ve put a few references in my Enemy series to the Trojan wars. I have also borrowed Homer’s tactic of using epithets - Quick shorthand descriptions of the characters so that you can keep track of who they are (red-haired Odysseus for example). Don’t worry, you don’t have to have studied the classic to get any of this. It doesn’t take a modern day Sherlock Holmes to spot that one character – a vain but nearly invincible warrior – is conveniently called Achilleus, and reasonably bright kids should spot a clever red-haired character called Ollie. The problem is that I can’t pretend that the Greek myths don’t exist, and that some of the characters in the books might well be familiar with them. It’s the elephant in the living room. I’ll just have to front it out. I’m not going to go so far as having Achilleus killed by an arrow to the heel - I don’t think I can even risk giving him a sprained ankle - but there will be elements of his story that mirror the legendary Achilles. I’m not too bothered how many of my readers spot the classical references. Some kids have noticed them and enjoyed them. I’ve mainly used them to make my life easier. The best writers steal ideas – but they only steal them from the greats. And, for me, Homer was the greatest. My main reason for wanting to read this book? Carolyn Mackler. I grew up on that lady's books and I will read every book she ever writes until she dies or I go deaf and blind and have no way to read anymore... uhh, whichever comes first. 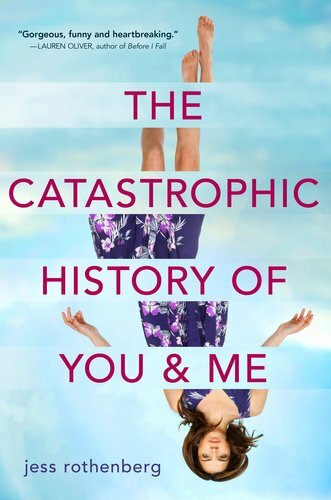 I'm not entirely sure where the book is going, since the summary doesn't say much in terms of plot, and that cover is not exactly one of my favorites, either, but WHATEVERRRR it's Carolyn Mackler I will read her whatever the plot and cover! 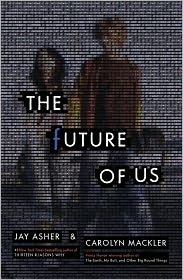 The Future of Us will be published in hardcover by Razorbill on November 21, 2011. Francisco Stork is another auto-read for me ever since I came across his stunning book Marcelo in the Real World. I was really excited when I heard that he had a new book coming out, and doesn't it sound like it will be so very powerful? 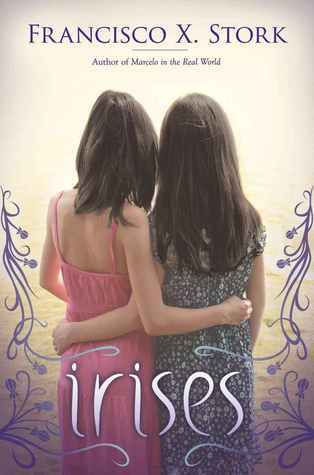 Irises will be published in hardcover by Arthur A. Levine Books on January 1, 2012. Gianna Zales is a seventh-grade cross-country star, but her running career and glory is jeopardized by the upcoming science project deadline. Gianna must collect and identify 25 leaves, but that’s a hard thing to do when your grandmother’s memory is failing, the mean girls at school are out to get you, your father drives you to school in a hearse, and you’ve never been one for deadlines. Still, perhaps with the help of some fantastic people in her life, Gianna will be able to learn from all her hardships, while still completing her leaf project. Kate Messner is a shining voice in middle-grade fiction. Her characters will rank right up there with Sharon Creech’s for best-friend potential. Messner effortlessly introduces us to the totally normal yet exceptionally charming Zales family within just a few pages. Characterization leaps off the page: Gianna’s mother, father, little brother, and grandmother all sound like they could be your next-door neighbors, the smoothness with which their characters are developed an unfortunately rare accomplishment in fiction. There are hardly any stereotypes, and those that are a bit flat (like Gianna’s mean classmates) are completely excusable and perfect in their two-dimensionality. The story is a beautiful weave of school troubles, family troubles, dealing with memory loss, and exploring new romantic feelings for your close friend. That’s a lot to pack into a book, but it never feels overwhelming in THE BRILLIANT FALL OF GIANNA Z. Messner proves that it’s not about the number of issues you are or aren’t allowed to include in a book, but rather the way the author integrates the problems. And she does it beautifully. Kate Messner is undoubtedly one of my favorite middle-grade authors. Her prose is effortless and her characters rich, and readers of all ages will be able to fall in love with the characters and find a bit of themselves in the book. THE BRILLIANT FALL OF GIANNA Z transcends its genre boundaries and becomes a classic tale of growing up that will reach anyone’s heart. Cover discussion: Oh how I love how original, colorful, and whimsical these covers are. They seem to have lightened the image between the hardcover and paperback; not a big deal! Copy...uh, I don't remember how I got the copy I reviewed in 2009, but I own a copy now! The beautiful and bookish Ivy Lockwell lives with her parents and two younger sisters. Mr. Lockwell is a prisoner of his own mind through his studies of magick, and the country of Altania is not sure what to make of its magickal elements. Society seems to shun or disdain magick, but there are some factions within the political system of Altania that believe Altania’s ancient magick still thrives, biding its time to rise up again. Desperate times force Ivy to take a job in the country with the enigmatic Mr. Quent. There, she learns just how tangled up she is in Altania’s magick. Ivy alone holds the key to protecting Altania from the wrath of a frightening magickal force. 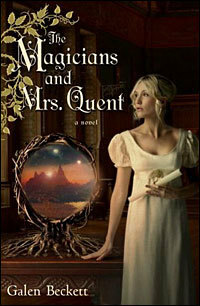 THE MAGICIANS AND MRS. QUENT sure sounds like something I would love. Historical fantasy, particularly with a Regency feel (although the story is set in a different world)… I’m all over it, right? This book was of that strange breed for which I know there were deep flaws with its premise, execution, and more, and yet found myself reading all the way through. First off, I don’t think I have ever read a book before which so blatantly copied from famous authors’ works. Beckett was clearly influenced by Austen and Bronte, not simply in terms of writing style, but in the story’s actual content. Parts 1 and 3 of THE MAGICIANS AND MRS. QUENT consist of the social pettiness and satire of an Austen novel, while Part 2 is blatantly reminiscent of Charlotte Bronte’s gothic, mystery atmosphere. The influence of these two authors on this book goes so far as to manifest itself in the book’s point of view: Parts 1 and 3 are told in third-person omniscient, whereas Part 2 switches to first-person from Ivy’s point of view. What, Beckett, you couldn’t even integrate it so that Ivy’s time at Quent’s place could be told in third person? As a reader, I simply did not see the logic in dividing these parts so. Ivy’s first-person narration in Part 2 seemed to have no significant influence on the story whatsoever, except that it makes it easier to “borrow” from the likes of Jane Eyre. Blergh. Similarly, the disjuncture of Part 2 from Parts 1 and 3 made it feel like two different stories were being told. Even in Part 3 the happenings of Parts 1 and 2 didn’t fit together in any believable way, leaving me no choice but to conclude that Part 2 seemed like an authorial indulgence in Victorian gothic storytelling with little to no bearing on what readers are led to believe should be the primary plot of the book—that is, the goings-on of Parts 1 and 3. So obviously the characters and their predicaments were pretty much completely jacked from Austen and Bronte (go on, read a few pages and tell me if any of Altania’s characters have never appeared in an Austen or Bronte work before). This led me to have a different reading experience with THE MAGICIANS AND MRS. QUENT than I usually have with a book—namely, that I knew the story was flawed and not very original, but continued to read out of my enjoyment of the, shall we say, “smallness” of the story. The story elements were poorly integrated, but it possesses the addictiveness of reading about petty people’s petty problems (from Austen) and the melodrama of an innocent girl exploring the “haunted” grounds of a tortured man (from Bronte). In short, what I liked about in book lay in its completely unoriginal elements. This makes me feel a little like a sellout. So THE MAGICIANS AND MRS. QUENT is not going to win any prizes, but if you can’t get enough of Austen and Bronte and don’t mind when some rather illogical magickal elements are thrown in, you might consider checking this book out. It serves, at the very least, as great entertainment as you count how many phrases come right out of the two famous women’s works. Cover discussion: A little bit of old mixed with the fantastical, which is perfect for this story and which appeals to me too. It’s been two years since Tom Mackee’s beloved uncle was killed in the London terrorist attacks, and he and his family are still reeling from it, closed off from one another in their own spheres of pain. Tom quit school and “works” at a local student union/pub alongside his former friends, who, despite his coldness towards them, have stubbornly refused to give up on him. Tom lives with his single, pregnant aunt Georgie, who has problems of her own. She feels like she can’t let her unborn child’s father, Sam, back into her life, not after what happened between them during their years-long relationship. However, with the patient love, shared pain, and quirkiness of his friends and family, perhaps there is a way for Tom, Georgie, and everyone else to heal. I have never read a book by Melina Marchetta that I haven’t loved, which makes her one of a kind. THE PIPER’S SON takes beloved characters from Saving Francesca and makes them hurt—makes us hurt in reading about their struggles—and yet leaves us with a story so powerful, so resonant, so complex, that it’s hard to imagine that such an accomplishment was achieved at the hands of a human being. Readers of THE PIPER’S SON should not expect the same tone as was in Saving Francesca. THE PIPER’S SON is dark. That’s because Tom Mackee is angry. Two years after his uncle’s death and Tom is still simmering, still resentful, still pushing everyone away and not taking care of himself. You’d hate him for being so self-absorbed if it weren’t for how subtly Tom heals throughout the course of the novel. Melina Marchetta’s characterization isn’t simply splendid. Her dialogue isn’t simply witty and spot-on—it’s revitalizing. The dialogue comes across as simultaneously natural and like the most wonderful thing you’ve ever read in fiction. The characters in THE PIPER’S SON really do come alive through their interactions with one another. Even Tom, so stuck in a cycle of self-torment is he, reveals himself to be capable of being vulnerable, of healing, of loving through his exchanges with others. 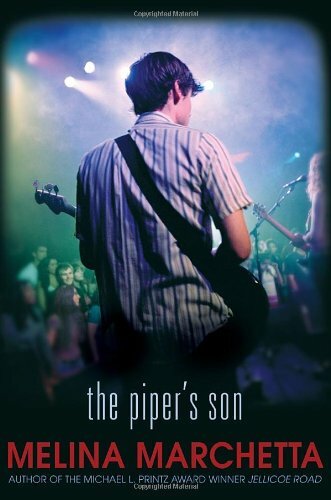 I had high expectations for THE PIPER’S SON and Marchetta didn’t let me down. THE PIPER’S SON is evidence of Marchetta’s incredible maturation as a writer since her wonderful book Saving Francesca. A must-read for Marchetta fans, and a book that will continue to astound me every time I think back to it. Cover discussion: I don't think that's really Tom in the picture, but I do like the image--the stark contrast between cool colors and black. 19-year-old Opal Cowan feels like a freak. She might be a powerful glass magician, but her skills are limited to just her glass. That and her connection to the events surrounding Liaison Yelena Zaltana four years earlier make her an outsider at the Magician’s Keep. Then Opal is called to investigate a case of Stormdancers’ glass orbs that have shattered, killing the Stormdancer working the magic. Opal suspects there’s a conspiracy underfoot, and between that and the newfound discovery of her magical abilities, she’s got more than enough to worry about. 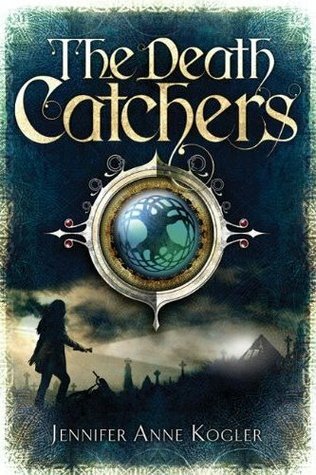 Maria Snyder of the Study trilogy fame knows how to write a rollicking, quest-based fantasy, and STORM GLASS is no exception. Despite a few characterization and narration issues, it remains overall an involved read. Opal is quite a different character than the beloved Yelena. She is shyer, much more reserved about her importance and power. Up till now, Opal’s life had been defined by her being or feeling inferior to those around her, and one of the most touching themes throughout this book is Opal’s struggle to be her own biggest fan, a theme that will resonate with lots of readers. Snyder writes with great attention to suspense and pacing, often ending chapters on a cliffhanger so that you have to keep on reading to know what happens. This is all well and good, and makes her books fast reads, but occasionally I wondered if I wasn’t too swept up in the fast pacing, and couldn’t slow down and concentrate on the characters or their predicaments if I wanted to. A couple elements in the story felt forced to me. Opal and Ulrick’s romance began very quickly (and out of troublingly overprotective gestures too), and I wasn’t allowed the time to warm up to Ulrick before they got together. Opal’s traumatic history seemed not to have affected her as much as Opal said it did—and then it rose up to become a significant part of this book in a way that felt, for me, a little like pulling at strings. 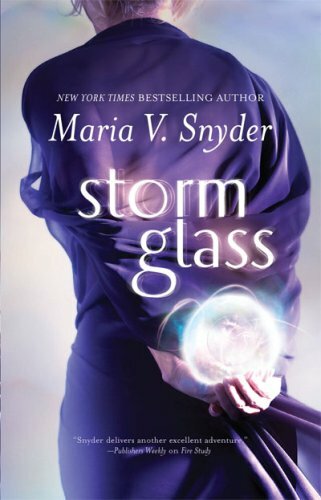 Overall, however, I was satisfied with STORM GLASS, and wouldn’t hesitate to read more of Maria’s works. I’d also highly recommend her books to reluctant fantasy readers. The headstrong protagonist, straightforward narration, and fast pacing will appeal to just about anyone! Cover discussion: I absolutely love all of Maria's covers, and this one is no exception. It's simple yet beautiful in a way that evokes magic, mystery, and romance to me. DiYA's Diversify Your Reading Summer Challenge! Diversity in YA, one of my favorite causes run by YA authors, is at it again! This time they've put time a spectacular summer reading challenge, complete with great giveaways. In Diversify Your Reading, participants are invited to read diverse MG and YA books over the summer, and to enter in the grand essay contest by the end of summer. Have you been thinking about diversifying your reads, but needed the extra incentive to get started? Then Diversify Your Reading is a great challenge to do it with! Check out DiYA's blog post for more information--and don't miss the spectacular start-up giveaway that's currently going on. Additionally, DiYA founders Cindy Pon and Malinda Lo might also post their favorite essays on DiYA's blog later this year! So much incentive, and to do what? To simply read! I'm going to do my best to write that essay for this challenge. I hope you will think about doing the same!